WHAT’S UP AT COLUMBIA GRAD? 1) Creating and co-facilitating Project LETS Spaces. These are mental health support groups (i.e. Survivor Coalition, Women and Nonbinary People of Color support group; First-generation/low-income Peer Support Group, Art and Healing, etc.). 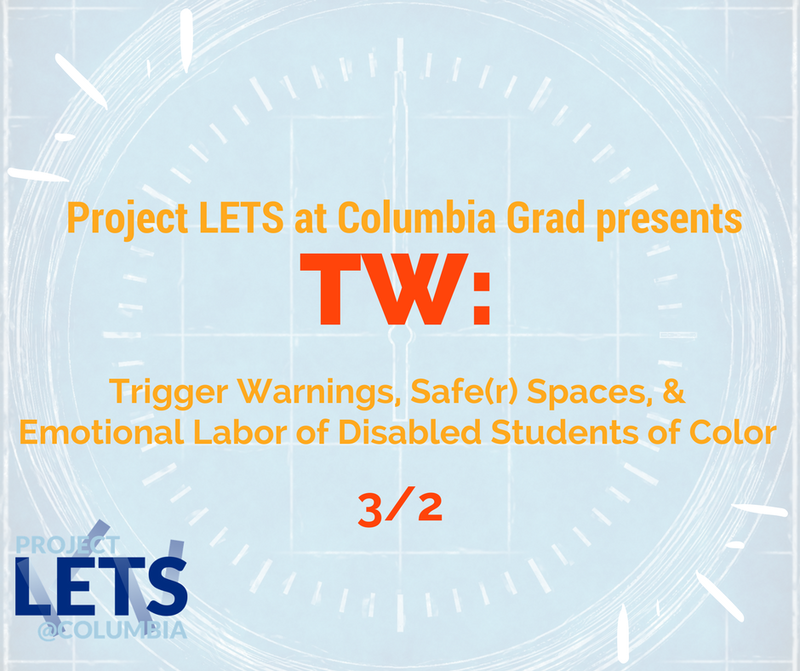 2) Project LETS Panels (student led, student attended) on topics like PTSD, disordered eating, Living with a Highly Stigmatized Mental Illness, OCD, imposter Syndrome within the Ivory Tower, etc. Other events include "Failure Confessionals" (where student submit letters regarding their failures in order to normalize the process), "Secret Life of Eating", etc. 3) Potential new events titles: "when the rainbow is enuf: WoC and Mental Health"; "Dialogue on Trigger Warnings"; "Breaking Bread Dialogues"; "Weekly Guided Meditation"; "Accessible CBT techniques for Well-being", etc. If you are still interested in training to become a peer-counselor or to become a part of our board, please feel free to reach out! We are still seeking (1-2) Political Action Coordinators, (1) Story-telling Coordinators, and (1) Undergraduate Liaison. We are working to start a Survivor Coalition Peer Support Group. The group is open to anyone who is a survivor of sexual violence, and is not exclusive to cis-women. Anyone within the community (outside of Columbia included) is welcome to join! If you are interested in being a member or co-facilitator please feel free fill out the form below. All membership and information within the group is confidential.